The mammalian protein kinase TLK1 is a homologue of Tousled, a gene involved in flower development in Arabidopsis thaliana. The function of TLK1 is not well known, although knockout of the gene in Drosophila, or expression of a dominant negative mutant in mouse cells causes loss of nuclear divisions and chromosome missegregation probably due to alterations in chromatin remodeling capacity. Overexpression of TLK1B, a spliced variant of the TLK1 mRNA, in a model mouse cell line increases their resistance to ionizing radiation, also likely through changes in chromatin remodeling. The TLK1B mRNA is translationally repressed by its 5'UTR and is regulated by the availability of eIF4E. We now report that radiation or doxorubicin result in an increase in the translation of TLK1B, and we have uncovered the likely mechanism for this effect. Radiation causes a shift in the polysomal distribution of TLK1B mRNA, from the untranslated region and small polysomes to the large polysomes, concomitant with an increase in the expression of TLK1B protein. This change is preceded by an increase in phosphorylation of the eIF4E inhibitory protein 4E-BP1, which releases eIF4E when it is phosphorylated. The phosphorylation of 4E-BP1 depends on mTOR, since rapamycin blocked the increase in phosphorylation induced by radiation, and prevented the increase in TLK1B protein expression. The activation of mTOR was likely due to the rapid activation of Akt following radiation. The activation of Akt could be inhibited with wortmannin, an inhibitor of PI3 kinase, hence placing PI3 kinase upstream of Akt as a very early event following radiation. Wortmannin also inhibited translation of TLK1B mRNA following activation by IR. This was shown both by western blot and by measuring the initiation capacity of the mRNA, as indicated by its distribution on polysomes. The translational upregulation of TLK1B elicited by DNA double strand breaks represents an interesting mechanism of translational regulation of a protein involved in radioprotection and highlights a novel mechanism of the stress response following radiation. The Tousled gene of Arabidopsis Thaliana encodes a protein kinase which, when mutated, results in abnormal flower development characterized by a stochastic loss of floral meristem and organs . Two mammalian Tousled-like kinases (TLK1 and TLK2) were cloned by Sillje et al., 1999  during a PCR-based search for human kinases, who also reported that the activity of these kinases is maximal in S phase, and more recently, these kinases were reported to be targets to checkpoint kinases, ATM and Chk1 . Since ATM and Chk1 are involved in the DNA damage checkpoint upon radiation, this suggests that TLKs may be involved in some aspect of genome surveillance, particularly chromatin remodeling concurrent with DNA repair (see below). We have recently cloned a cDNA encoding a mammalian Tousled-like kinase (TLK1B) through a very different scheme, based upon polysomal redistribution of weakly translated transcripts that become preferentially recruited upon overexpression of eIF4E . Indeed, the human TLK1B mRNA (a splice variant of the TLK1 mRNA cloned by Sillje) contains a 5'UTR 1088-nt-long with two upstream AUG codons, which was found to be very inhibitory for translation. The inhibition of translation could be relieved by either overexpressing eIF4E, or by deleting a large section of the 5'UTR. We subsequently discovered that TLK1B overexpression protects the cells from the genotoxic effects of radiation (IR) or the radiomimetic drug, doxorubicin. TLK1B probably exerts this effect by phosphorylating histone H3 (4) and the histone H3 chaperone Asf1 , and thereby promoting chromatin remodeling concurrent with repair of DNA damage. While these protective effects by TLK1B against radiation appear clear, the reason for the translational regulation of this protein and its dependence on elevated eIF4E was not obvious. One possible explanation is the rapidity of a translational response to DNA damage, which does not require de novo gene expression. Following DNA damage by IR, which produces double strand breaks (DSBs), synthesis of TLK1B could be induced through an uncharacterized translational control mechanism that most likely involves eIF4E. TLK1B could then facilitate repair of DNA damage through chromatin remodeling. In this report, we investigate the translational regulation of TLK1B following IR or doxorubicin in more details. An attractive idea is that TLK1B is regulated translationally to respond rapidly to DNA damage. To test this hypothesis, we used the MM3MG cells stably transfected with a vector expressing full-length TLK1B cDNA (which contains the regulatory 5'UTR) to monitor the expression of the protein by western blot during a period of incubation with doxorubicin, which in time causes double strand breaks (DSBs). Accumulation of TLK1B protein began at 1 hr and was maximal by 3 hr of incubation with doxorubicin, while at the same time, the expression at the mRNA level did not change from the t = 0 (untreated cells), possibly indicating a change in translation of TLK1B mRNA (Fig. 1A). (Equal loading of the northern blot was confirmed by reprobing for β-actin mRNA). Note also that during the same time course the level of TLK1 (the larger protein) did not change. This isoform is produced by an alternatively spliced mRNA with a short 5'UTR that is not translationally regulated. Similar results were obtained during a time course after IR (not shown), indicating that a mechanism exists for the translational increase of TLK1B in presence of this type of DNA damage, DSBs. To confirm that there was a change in TLK1B protein synthesis, cells were incubated with radiolabeled methionine for the last 20 min of a time course of incubation with doxorubicin. Immunoprecipitation of cell extracts showed that TLK1B synthesis began within 0.5 h of incubation with doxorubcin and was maximal after 2 h (Fig. 1A). Therefore, stimulated synthesis of TLK1B preceded maximal accumulation of the protein, as seen by western blot, and it was apparently a very rapid response to the induction of DSBs. TLK1B mRNA is translationally upregulated by agents causing DSBs. A. incubation with doxorubicin causes a time-dependent increase in TLK1B expression without a change in the mRNA level. 2 × 106 cells were incubated with 0.2 μg/ml doxorubicin for increasing times, and then the proteins and RNA were separately extracted and processed for western and northern blots of TLK1B (left panel). Aliquots of 2 × 105 were labeled with 30 μCi of tran35S-label for the last 20 min of each time point (right panel). B. Redistribution of the TLK1B transcript in the polysomes of MM3MG cells expressing TLK1B. Cell extracts of control and irradiated cells (2×107) were prepared and sedimented for 2 h through sucrose gradients. Fraction aliquots were applied to a membrane in duplicates with a slot-blotter. The membrane was cut into strips and probed with either, an oligonucleotide specific for TLK1B, or with a cDNA for actin. Fractions corresponding to heavy polysomes (≥ 6 ribisomes), light (2–5 ribosomes), 80S, 60S and 40S ribosomal subunits, and small RNPs (Unbound) are indicated. The experiment in Fig. 1A indicated that the TLK1B mRNA is translationally derepressed after treatment of cells with agents that cause DSBs. To confirm that this mechanism exists, the distribution of TLK1B mRNA in the polysomes of cells treated or not with IR was determined. An increase in the rate of translation initiation of a mRNA results in a larger loading of ribosomes along its length and this results in a faster sedimentation rate. Fig. 1B shows that this is, in fact, the case as exposure of cells to IR followed by a 1 h of recovery resulted in a redistribution of the TLK1B mRNA to fractions corresponding to the heavy polysomes. In contrast, in untreated cells, the TLK1B mRNA sedimented predominantly in the small polysomes and the ribosome-unbound fractions, confirming that normally it is not well translated. This enhanced utilization after IR was specific for TLK1B, since a strong mRNA, like β-actin, did not display a polysomal shift compared to control, untreated cells. Also, the polysome traces indicated that there was little difference between cells treated with IR and controls, as exemplified by a similar level of 80S monosomes. This indicates that overall translation initiation rates were similar in control and cells treated with IR. The uncharacterized mechanism of translation of TLK1B following IR is most likely due to a change in eIF4E activity or abundance, since overexpression of eIF4E results in increased translation of TLK1B . We established that IR did not change the expression of eIF4E (Fig. 3B). The activity of eIF4E is regulated by the inhibitory protein 4E-BP1. 4E-BP1 releases eIF4E upon phosphorylation by the kinase mTOR (mammalian target of rapamycin), which is downstream of Akt . This results in the immediate increase in the pool of eIF4E available for translation initiation, or more specifically in formation of the eIF4F complex. Therefore, we wanted to determine if the phosphorylation of 4E-BP1 changed after IR. The phosphorylation of 4E-BP1 at Thr 46 (a site phosphorylated by mTOR) was monitored with a phospho-specific antibody during a time course following 10 Gy of IR. A strong phosphorylation increase at Thr 46 was evident 1 h after exposure to IR and remained elevated for at least 4 h (Fig. 2A). This time course corresponded very well with the change in TLK1B expression after IR and suggests that the translation of TLK1B is induced by an increase in 4E-BP1 phosphorylation resulting in an increase in free eIF4E. The gel showed that the phospho 4E-BP1 migrated as doublet, suggesting that additional site(s) are phosphorylated in addition to Thr46. Since there is a hierarchical system of 4E-BP1 phosphorylation withThr70 depending on prior phosphorylation at Thr46 [7, 8], we also tested the phosphorylation of Thr70. Phosphorylation at Thr70 results in decrease affinity of 4E-BP1 for eIF4E. The results showed an increase in Thr70 phosphorylation with kinetics similar to those of Thr46. Translation of TLK1B is dependent on phosphorylation of 4E-BP1 after IR and is sensitive to rapamycin. A. The phosphorylation of 4E-BP1 is induced by IR. Aliquots of cells were incubated for increasing time following IR (10 Gy), the proteins were separated on a 15% PAGE/SDS, transferred to a membrane, and probed with antibody to 4E-BP1 phosphorylated at Thr 46. B. The hyperphosphorylated form of 4E-BP1 is induced by IR and is sensitive to rapamycin. The cells were incubated for 1 h after IR with increasing concentrations of rapamycin. Total 4E-BP1 was analyzed by western blot with an antibody that recognizes all forms of 4E-BP1. The position of the 3 forms of 4E-BP1, from unphosphorylated (α) to hyperphosphorylated (γ) are indicated. C. The translational upregulation of TLK1B following IR is blocked by rapamycin or wortmannin. The cells were incubated for 1 h after IR with or without 20 nM rapamycin and then processed for western blot with the TLK1 antibody, which recognizes the large and small (TLK1B) spliced variants of TLK1 (left panel). The same experiment was carried out with 30 μM wortmannin (right panel). The phosphorylation of 4E-BP1 correlates with activation of Akt and is sensitive to wortmannin. A. Akt is phosphorylated after IR. The cells were incubated for 1 h after IR with or without 30 μM wortmannin and then processed for western blot for either total Akt (lower panel) or Akt phosphorylated at Thr 473 (upper panel). B. wortmannin reduces the phosphorylation of 4E-BP1 which is induced by IR. The cells were incubated as in A, and analyzed by western blot for total 4E-BP1. The position of the 3 forms of 4E-BP1, from unphosphorylated (α) to hyperphosphorylated (γ) are indicated. A western blot for eIF4E is also shown. We also tested for the phosphorylation of p70-S6K at Thr389, which is also a target of mTOR activation, and found that its phosphorylation was increased 1 h after irradiation (Fig. 2A), which is slightly later than the phosphorylation of 4E-BP1 at Thr70 and 46. These findings strongly implicate the activation of mTOR following the induction of DSBs, resulting in phosphorylation of 4E-BP1 and release of eIF4E. To further confirm that the increase in 4E-BP1 phosphorylation was attributable to an increase in mTOR activity, the phosphorylation of 4E-BP1 was monitored by following the mobility of the slowest migrating form (γ) 1 h after the cells were irradiated in the presence of increasing concentrations of rapamycin (a specific inhibitor of mTOR). As shown in Fig. 2B, in the absence of rapamycin, IR induced an increase in the amount of the γ-form (the hyperphosphorylated 4E-BP1). However, at 20 nM rapamycin this increase was abolished with a corresponding increase in the α-form, indicating that mTOR is directly involved in the phosphorylation of 4E-BP1 following IR. 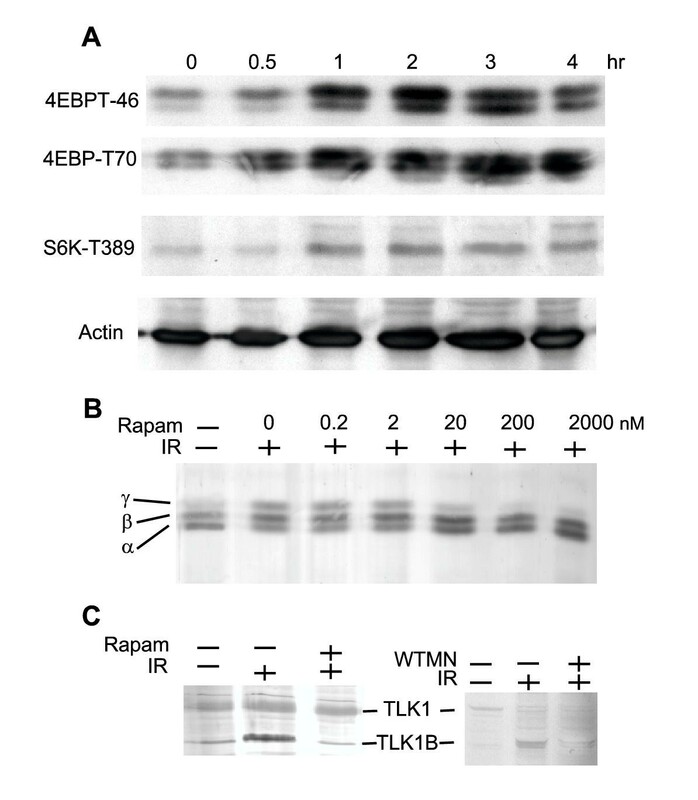 To monitor if the synthesis of TLK1B was also sensitive to rapamycin, we performed a western blot for TLK1B in cells incubated 1 h after IR in the presence or absence of 20 nM rapamycin. As shown in Fig. 2C, the increased expression of TLK1B induced by IR was completely abolished by the addition of rapamycin. Wortmannin, an upstream inhibitor of the mTOR pathway (see below), also inhibited to some extent the synthesis and accumulation of TLK1B following IR (Fig. 2C). Since mTOR can be phosphorylated and activated by Akt , and Akt is a critical survival factor that is activated by PDK in response to a variety of stimuli, we wanted to test if IR was also a stimulus that induced activation of Akt. To monitor for activation Akt, its phosphorylation state at Ser 473 (an activating event) was tested. Two recent papers have shown that the activation of Akt is very rapid after IR (10–15 min) [10, 11] and dependent on activation of PI3 kinase . Since mTOR is activated through Akt, it seemed possible that the change in 4E-BP1 phosphorylation was initiated by Akt and that this activation was also dependent on PI3 kinase. To determine this, the status of Akt phosphorylation at Ser473 was monitored at 1 h following IR (10 Gy). 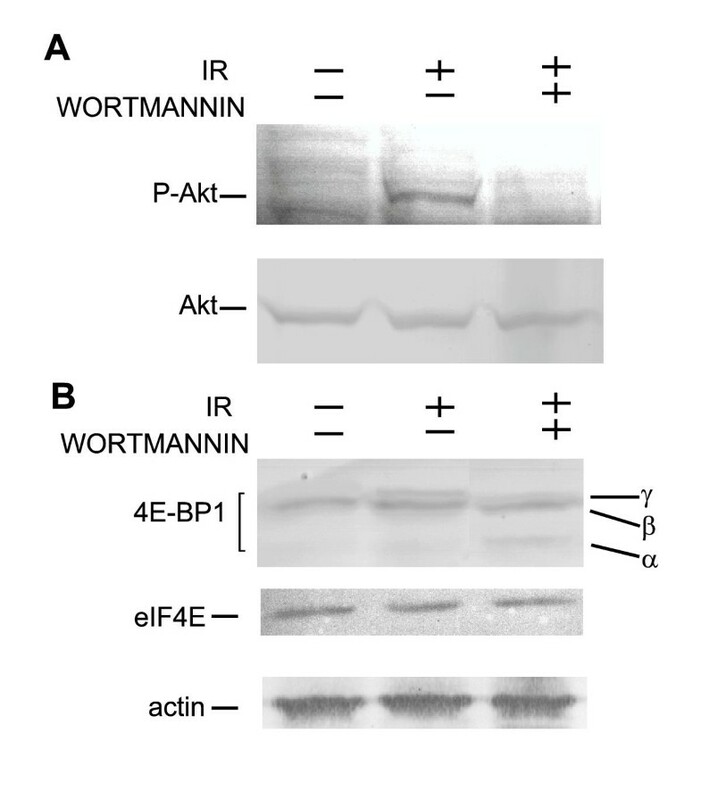 Indeed, Akt was phosphorylated after IR, and this phosphorylation was completely suppressed by the addition of 30 μM wortmannin, an inhibitor of PI3 kinase (Fig. 3A). Likewise, the presence of wortmannin suppressed the phosphorylation of 4E-BP1 that is induced by IR (Fig. 3B) as shown by reduced level of the γ-form and increase of the α-form. Hence, the phosphorylation of 4E-BP1 following IR is dependent on PI3 kinase through activation of Akt. Wortmannin also suppressed the synthesis of TLK1B induced by IR, confirming that its synthesis depends on 4E-BP1 phosphorylation through activation of Akt. We wanted to confirm if the activation of TLK1B synthesis after IR was inhibited by rapamycin and wortmannin at the level of translation initiation. To do so, the distribution of TLK1B mRNA on polysomes from irradiated cells, but incubated in the presence of rapamycin or wortmannin was monitored. As shown in Fig. 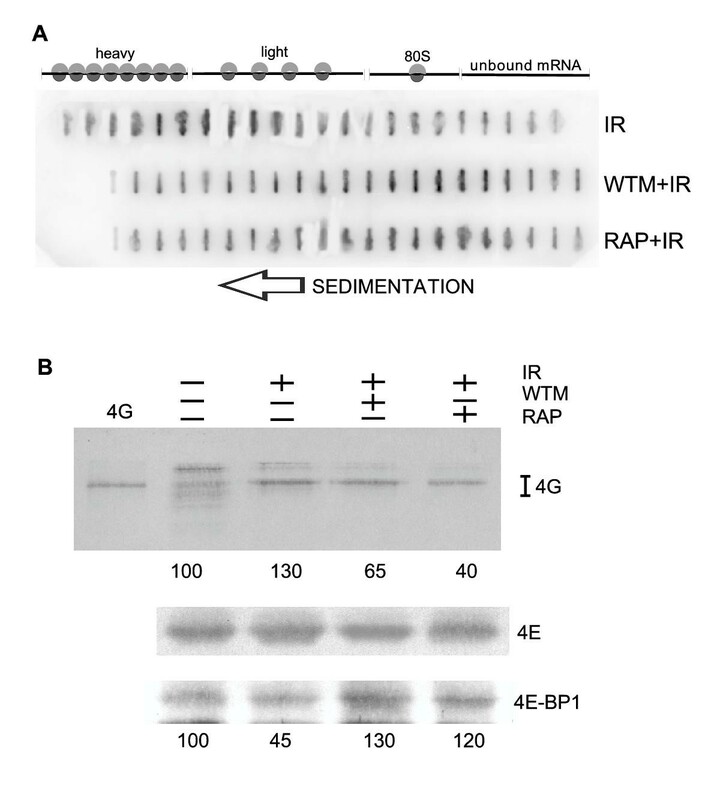 4A, both rapamycin and wortmannin prevented the shift of TLK1B mRNA toward the heavier polysomes which is induced by IR (compare with Fig. 1B). This confirmed that the increased translation initiation of TLK1B mRNA, which is activated by IR, is responsive to the Akt and mTOR pathway likely through the phosphorylation of 4E-BP1. A. Rapamycin or wortmannin inhibit the shift in polysomal redistribution of TLK1B mRNA. The cells were irradiated and then incubated for 1 h (as in Fig. 1B) in the presence (or not) of rapamycin or wortmannin. B. IR induces an increase in the amount of eIF4G associated with eIF4E and conversely a decrease in the amount of bound 4E-BP1, both of which are inhibited with rapamycin or wortmannin. 0.1 mg of cell extract from the cells treated as indicated in the figure was adsorbed onto m7GTP-Sepharose for 1 h on ice, after which, the bound protein was resolved on a 10% SDS/PAGE. The gel was blotted onto nitrocellulose and sequentially probed for eIF4G, eIF4E, and 4E-BP1. The total immunoreactive signal from eIF4G was used for the quantitations. The lane labeled 4G is recombinant full-length eIF4G isolated from Sf9 cells. The increase in 4E-BP1 phosphorylation following IR should result in an increase in the amount of free eIF4E available to bind eIF4G to form the eIF4F complex. To determine this, 0.1 mg of extract from irradiated cells, treated or not with rapamaycin or wortmannin, was adsorbed on m7GTP-Sepharose to bind eIF4E and its associated proteins (eIF4G or 4EBP1). Indeed, IR caused a small but reproducible increase in the amount of eIF4G pulled down by the resin (Fig. 4B, see quantitation under each lane). This increase was completely inhibited by the addition of rapamaycin or wortmannin. In control (non-irradiated) cells, the main eIF4G band migrated more slowly than the eIF4G band found in irradiated cells. It is tempting to speculate that this represents a change in the phosphorylation status of eIF4G, but the mobility pattern of this complex protein in SDS/PAGE remains largely a mystery. The main band migrates as full-length, recombinant human eIF4G1 isolated from Sf9 cells (first lane), clearly indicating that this is not a degradation product. The amount of eIF4E bound by the resin was approximately the same for each cell extract, confirming equal protein loading for each column (Fig. 4B). Therefore, IR induced the formation of some additional amount of eIF4F, which was inhibited by rapamaycin or wortmannin. It should be noted that the amount of 4E-BP1 bound to eIF4E, as indicated by its retention on the resin, also changed slightly under all three experimental conditions (Fig. 4B). It was slightly decreased after IR and slightly increased after incubation with rapamaycin or wortmannin. If so, we were able to demonstrate a reciprocal competition between eIF4G and 4E-BP1 for binding to eIF4E. There appeared to be only one form of 4E-BP1 bound to the resin, which we assume to be the unphosphorylated form. Protein synthesis is energetically the most expensive process in the cell and, not surprisingly, translation rates are tightly regulated . In mammals, most of the regulation thus far discovered operates at the level of translation initiation, rather than elongation or termination . The initiation process is comprised of three steps: 1) formation of the 43S complex, composed of a 40S ribosomal subunit and the initiation factors eIF-2, eIF-3, Met-tRNAi and GTP; 2) formation of the 48S complex containing mRNA, which is mediated by the eIF4 group of factors; and 3) joining of the 60S subunit to form the complete 80S complex. In most circumstances, the second step is rate limiting and hence, a major point of regulation. This step is also a point of discrimination, since one particular mRNA is selected from the untranslated pool and recruited to the ribosomes. This process is mediated by the eIF4 group of factors, for which free eIF4E is rate-limiting [14–16]. Under normal cellular conditions, eIF4E is largely bound by the inhibitory eIF4E binding proteins (4E-BPs), which sequester eIF4E from interacting with eIF4G, which binds to the same convex side of eIF4E as the 4E-BPs . Upon stimulation by mitogens, the 4E-BPs become phosphorylated at multiple sites as a consequence of both the ras-ERK and PI3 kinase/AKT signaling pathways. These phosphorylation events release the 4E-BPs from eIF4E thereby liberating eIF4E and enabling eIF4E to effectively recruit mRNAs to the eIF4F complex [reviewed in ]. We have previously reported that TLK1B synthesis is regulated at the level of translation by the abundance of eIF4E , but the reason for this mechanism was not understood. In this work, we present evidence that the mechanism for this regulation is likely to be a very quick response to the presence of DSBs induced by IR or doxorubicin. This would allow for the immediate synthesis of TLK1B, which could then participate in repair of DNA damage. We further show that the mechanism of translational upregulation is through activation of mTOR and concurrent phosphorylation of 4E-BP1, which results in the release of eIF4E for participation in mRNA recruitment. This increase in the available eIF4E is akin to overexpressing eIF4E, which results in increased translation of TLK1B mRNA . However, we cannot exclude the possibility that activation of S6 kinase and consequent phosphorylation of S6 could contribute to the increase translation of TLK1B. Evidence that mTOR is directly involved in the phosphorylation of 4EBP1 was provided by the fact that rapamycin, a specific inhibitor of mTOR, resulted in suppression of 4E-BP1 hyper-phosphorylation (γ-form) and loss of synthesis of TLK1B following IR. The activation of mTOR by IR had not been previously reported, but became a most logical step once we uncovered that TLK1B is translationally regulated after IR. This was, however, not entirely expected since other stresses such as heat shock, osmotic shock, or UV, and in one report, IR  leads to a decrease in protein synthetic rates correlated with a decrease in eIF4F activity [reviewed in ]. However, others have shown that the same treatments cause activation of Akt [10, 21], presumably leading to activation of mTOR and phosphorylation of 4E-BP1. These differences are likely due to experimental conditions and the times at which samples were taken for analysis after IR. Thus, the mechanism of activation of mTOR by IR shown in this study, followed by phosphorylation of 4E-BP1, became the next question. Since mTOR is activated by Akt, although it is not clear if this is a direct or indirect activation [reviewed in ], we decided to monitor if Akt was activated by IR by studying its phosphorylation state, which was reported to be an early response to IR [10, 11]. We were able to reproduce these observations since Akt was phosphorylated after IR and this activation was sensitive to wortmannin, a specific inhibitor of PI3 kinase that is upstream of Akt. IR does not cause a significant increase in protein synthesis rates at early time points, although the translation of 5'TOP mRNAs (e.g., those encoding ribosomal proteins and PABP) is specifically increased by two-fold . However, TLK1B mRNA that does not contain a 5' polypyrimidine track was specifically recruited to the polysomes within 1 h after IR. This is presumably due to an increase in the available "free" eIF4E following phosphorylation of 4E-BP1. The translational activation of TLK1B is particularly intriguing given its role in radioprotection . Presumably, the reason for the translational regulation of TLK1B mRNA is to provide a rapid means of increasing the expression of TLK1B protein, which consequently affords protection against the damaging effects of IR. It should be noted that in several cancers, Akt is either overexpressed or constitutively activated, and this correlates well with the pattern of radioresistance and treatment failure in patients [reviewed in ]. 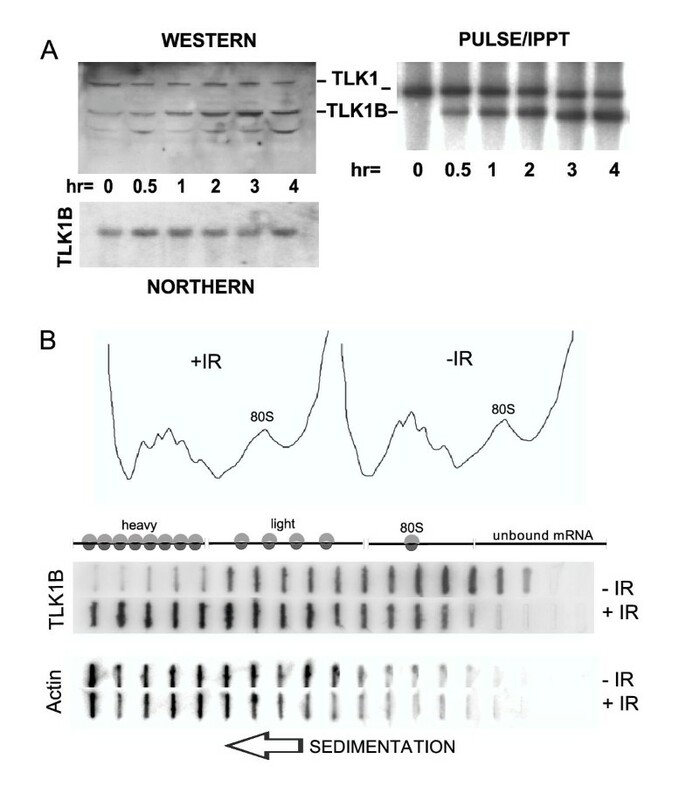 It seems possible that the active Akt could lead to enhanced expression of TLK1B and hence, a corresponding increase in the pattern of radioresistance due to the protective effect of TLK1B expression. This is, of course, in addition to the anti-apoptotic effects provided by Akt . The translational upregulation of TLK1B elicited by DNA double strand breaks represents an interesting mechanism of translational regulation of a protein involved in radioprotection and highlights a novel mechanism of the stress response following radiation. We propose a pathway of TLK1B translation that begins with activation of PI3 kinase very quickly after IR. This is followed by activation of Akt, which then activates mTOR, which then phosphorylates 4E-BP1. The phosphorylation of 4E-BP1 results in release of eIF4E, which is then competent for formation of the eIF4F complex. This increase in available eIF4F results in increased utilization of the TLK1B mRNA resulting in increased expression of TLK1B protein. MM3MG (normal mouse mammary fibroblasts) cells stably transfected with a vector to express TLK1B were previously described and cultured in DMEM with 5% FCS. The cells were briefly treated with cycloheximide at a final concentration of 150 μg/ml (Sigma) to freeze the ribosomes, and harvested with 2.5 mM EDTA in PBS. The cytoplasmic cell extract was layered on a 15% to 30% linear sucrose gradient and centrifuged in a SW41 rotor at 38,000 rpm for 2 h. After which, the gradient was fractionated using an ISCO UA-5 flow-cell UV monitor. Aliquots from sucrose gradient fractions were filtered through BioBlot-NC (Costar) using a Minifold II Slot Blot apparatus (Schleicher & Schuell), and fixed onto the membrane with 10% formaldehyde for 3 minutes. For Northerns, the RNA was isolated with the Tri-reagent (Molecular Research center, Inc.) and denatured with glyoxal/DMSO, separated on 1.3% agarose gels and transferred to Immobilon-Ny+ membrane (Millipore). The membranes were prehybridized with 7% SDS, 0.5 M Na2HPO4 (pH 7.4), 10 mM EDTA, at 45°C for 3 hours, and hybridized overnight at 45°C in the same buffer containing the 5' 32P-labeled primer: ccgccgagcccggggttgga (106 cpm/ml). This primer is specific for the TLK1B splice variant. For western blots, 20 or 30 μg of protein of each sample was separated on a 10% SDS-PAGE gel, or 15% for 4E-BP1. A rabbit antiserum raised against GST-TLK1B was prepared in our lab. The 4E-BP1 antibody, and the Thr 46 and Thr 70 phospho-specific 4EBP1 antibodies were from Cell Signaling (Beverly, MA). The Akt antibody, the Ser 473 phospho-specific Akt antibody, and the phospho-Thr 389 p70/S6 kinase antibody were also from Cell Signaling. Secondary HRP-conjugated anti-rabbit or anti-mouse serum was from Vector (Burlingame, CA). To determine the phosphorylation state of the proteins, the cells were incubated with or without drugs (Wortmannin (Sigma) or Rapamycin (Sigma)) for 15' prior to irradiation (10 Gy), after which the cells were returned to the incubator for 1 h prior to lysis for PAGE. This work was supported by grant BCTR0100512 from the Susan G. Komen Foundation to ADB. MF prepared the western and the pulse labeling/immunoprecipitation for Fig. 1. ADB prepared the northern blots for Fig. 1, the northern blot for Fig. 4, and wrote the paper. GSD prepared the western blots for Fig. 2, Fig. 3 and Fig. 4.